Stuart Allen is a writer of songs and stories. I have his sentimental track The Invisible Woman on repeat around here (you can listen to it on Soundcloud https://soundcloud.com/dangarstu/the-invisible-woman). He has recently published his novel Parting Lines and is experimenting with some unique marketing ideas. Here I ask him about his novel, the differences between songwriting and novel writing and being an indie writer and musician and how he is promoting Parting Lines. Tell us a little about your debut novel Parting Lines and how you came up with the idea ? Parting Lines was essentially conceived the day I bought an old typewriter from Reverse Garbage in Marrickville. I took it home, marvelled at its charm, opened a bottle of scotch then started using it to write short passages ranging in size from a single line to about half a page. At the time, they were all disconnected, each just investigating an idea that I either found interesting or amusing. Sitting at a typewriter is a great way to explore a stream of consciousness without the temptation of editing as you go. You’re also a singer/songwriter. How did you find the experience of writing long-form fiction and does your song writing influence your fiction writing in any way? I have to say I enjoyed the experience of writing long-form fiction from beginning to end. I can’t say there was a single moment where it felt like a chore, so from that perspective it was great. The challenges are different, that is for sure. In some ways it is simpler: no need to count syllables, find words that rhyme, combine multiple instruments that harmonise and compliment each other, never stepping on each other’s toes in the audio spectrum; but in other ways it is harder: a novel must remain cohesive and well paced over tens of thousands of words. I guess the biggest clue as to how hard writing a novel is compared to a song, or even an album of songs, is the number of people in the acknowledgements page of the book. Although I have collaborated with others on songs, there are plenty I have recorded solo, but there is no way the book could have been produced to any standard without the team of professional people that helped. But has my song writing influenced my novel writing? I think it has. With a song you are trying to capture the essence of a simple idea. You still need to build on that idea each verse to give the song a sense of progression, but in many ways they are like a flavour or a smell. The choice of words, the tone of the instruments, the tempo, they all combine to give a certain feel and that is also how I approach the writing of each scene. I have always loved song, stories and movies that have a strong atmosphere and sense of place, and that is what I most tried to carry over into the writing of Parting Lines. Just as there are a lot of changes going on in writing and publishing in this digital era, there are a lot of new opportunities for musicians getting their music out there on platforms such as Soundcloud and Youtube. 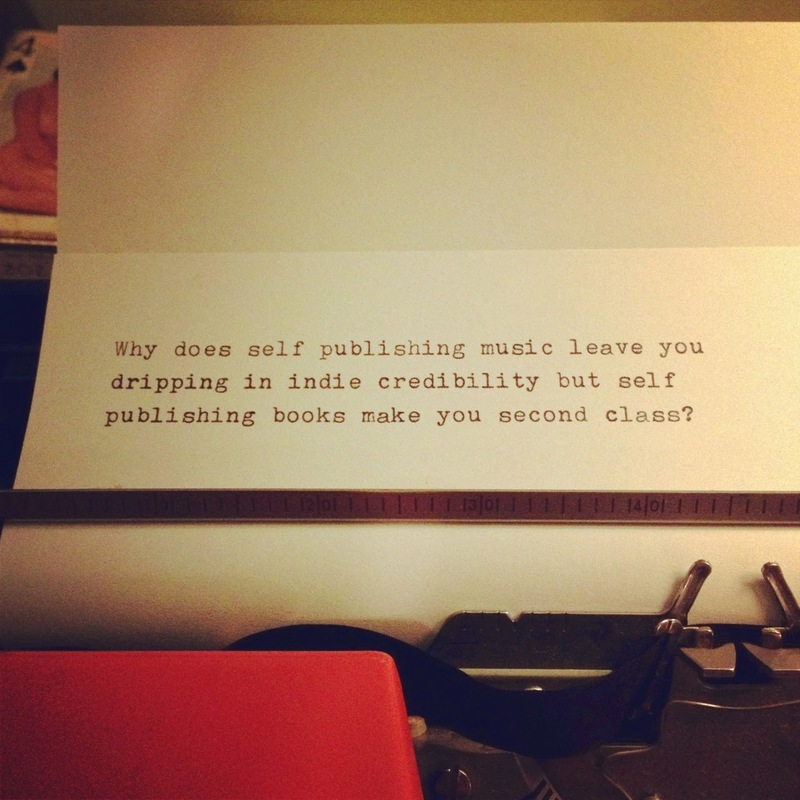 What do you find are the similarities and differences between being an indie writer and an indie musician? There is no doubt that the digital age allows you to distribute your songs and stories to the entire planet, but that of course doesn’t mean they are going to be read or listened to. Songs have the advantage here as people will commit to listening to a three-minute song while they are doing the washing up much more readily than they will give up many hours of focussed attention to read a novel they stumble across. In fact I would go so far as to say that people will almost never do that no matter how many times a promotion company with 500 thousand “followers" tweets to tell them they should. The distribution of songs and stories is largely very similar, the marketing is worlds apart. As the photo says, there is also a huge gulf in the perception of self publishing in these two markets. The music market has an inherent rebelliousness that lends itself well to being independent; the book industry is more conservative and authors seem to value the recognition of a publishing house more. The same goes for readers too. With such a huge amount of time needed to read a novel and determine if it is good or not, readers look to publishing houses to decide what is worthy of their time and what isn’t. To complete the crossover though, I am planning to record the first few chapters of my novel as an audiobook and post it on SoundCloud. I’ll let you know how that turns out on my next Book Marketing blog post. Tell us a little about Book Crossing and how you are using this as a unique way to get your book out there to people? So if tweeting to 500 thousand followers doesn’t get you 490 thousand sales (some people just have bad taste), then what does? Word of mouth. Time and time again people will tell you that almost every book they read is as a result of a personal recommendation from someone they trust. This launches the independent author straight into a catch 22. People won’t read your book until someone recommends they do, but so far no one has read it to recommend it. I see giving copies of your book away as an entirely valid way to break this catch 22 and seed the pool of copies that are out in the wild being read. Giving away ebooks isn’t a new strategy, and evidence seems to indicate that it works quite well, but I personally feel there is a lot of value in giving away paperback copies too. There is obviously a cost involved in doing this and see registering each book with Book Crossing as a way of maximising this investment. It increases the chances that your book will be passed on, and it also increases the chances of each reader posting a review. Goodreads giveaways are another way to achieve this same goal.